Version 3.12 of KioWare for Android is now available! This version features a new Guided Setup wizard for faster configuration, plus other requested features. Version 3.12 of KioWare for Android is now available! This version adds support for multiple URLs as start page tabs, offers an easier way to generate provisioning files, features a new Guided Setup wizard for faster configuration, and more. Read the full press release here. Version 3.12 of KioWare for Android is available in models Lite, Basic, and Full with Kiosk Management. The most notable feature in version 3.12 of KioWare for Android is the new Guided Setup. This wizard allows you to first select the type of deployment you need, so that the guided configuration setup is then tailored to your needs. The Guided Setup walks you through selecting settings and entering information to quickly customize the appearance and functionality of your kiosk. The Guided Setup helps new users quickly and easily configure KioWare. If you’re updating KioWare for Android from an existing version, you won’t see – or have a need for – the Guided Setup. To access the Guided Setup, just open the KioWare for Android Configuration Tool; the Guided Setup launches automatically the first time you open the Config Tool, and after that can be accessed from the menu at the top right. The first time you run the KioWare Configuration Tool, the Guided Setup welcome screen appears; to set up your configuration, just answer questions about your kiosk deployment and follow the prompts. The Guided Setup has options for a single app mode purposed device, non-interactive digital signage device, and interactive device. From there, the Guided Setup walks you through relevant settings for your start page; which domains/webpages or applications you want to allow; how popups should be handled; inactivity settings; attract screen options; if there’s a toolbar; and more. Once you complete the Guided Setup, click Finish. Selections made in the Guided Setup translate to settings in the KioWare Configuration Tool and are saved there. If your deployment requires more advanced options, features, and/or customizations of your KioWare configuration, you’ll want to access those settings directly in the relevant Config Tool tabs. View a full description of new features in version 3.12 for the entire KioWare for Android product line. All KioWare products can be used to secure devices such as tablets, desktops, and smartphones running Android or Windows Operating Systems. 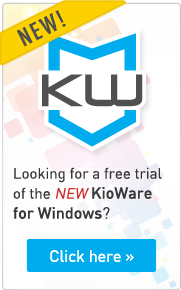 KioWare kiosk software products lock down your device into kiosk mode, which secures the overall operating system, home screen, and usage of applications. All of these products are available as a free trial at kioware.com. If you’re running a previous version of KioWare for Android, we recommend updating to version 3.12, which is accessible from your kioware.com user account under Your Downloads as long as your Maintenance & Support is current. Have questions about version 3.12 of KioWare for Android? Just contact us and we’ll be happy to help.